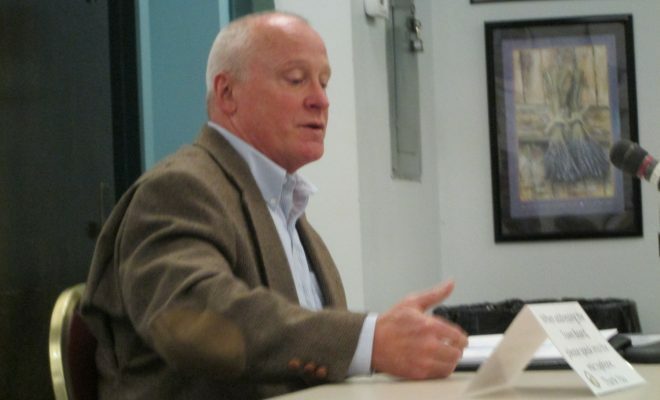 Newly hired consultant Greg Moberg met with members of the Palisade Planning Commission last Monday, February 6, to begin the process of rewriting the town’s Land Development Code (LDC). Moberg was chosen from a number of candidates that responded to a Request for Proposals (RFP) sent out by the town late in 2016. Although the LDC was just adopted in 2008, there was an economic downturn at around the same time, putting a damper on local development. The 2008 version of the code as adopted turned out to be difficult to work with, as well as being poorly organized, lacking in standard definition of terms and requiring complicated application processes. Members of recent planning commissions have taken on sections of the LDC at a time, trying to improve the clarity and organization, but it became too much of a job for the all-volunteer board to take on, as well as being somewhat time-sensitive regarding its adoption and use. The November election results approving the sale of recreational marijuana in Palisade, as well as the general condition of the local economy, have added urgency to the need for a building code rewrite. Trustees had already approved a $25,000 line item in the 2017 budget to be used to match any grant funding received for the purpose of facilitating the rewrite of the LDC. When the Colorado Dept. of Local Affairs (DOLA) gave the go-ahead for the grant request late last fall, the RFPs were sent out. Moberg was chosen in January from a field of applicants by a committee consisting of town staff and a planning commission representative. Moberg introduced himself to the remaining Planning Commission members at the Monday evening meeting and outlined his vision for the project. In addition to the $50,000 budget limitation on the projected work, there is also a time deadline. DOLA requires that project funds be spent before August 31, 2017. Although it is an ambitious project, Moberg is confident that with input from the town staff, planning commission members and the public in general, the goal can be met. He is planning a handful of ‘public meetings’, likely to be held as part of regularly scheduled public meetings of the Board of Trustees, to listen to public input as well. There may also be additional work sessions of the Planning Commission scheduled over the next few months to assist Moberg. Dates will be announced as meetings and work sessions are scheduled, all are open to the public. 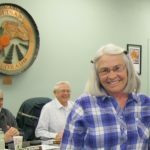 Palisade Trustee Susan L’Hommedieu was introduced to Planning Commission members at Monday’s meeting as the new ex-oficio member of the Board of Trustees to the Planning Commission. Each Trustee sits on various other boards and committees throughout the county to gain more knowledge and experience in local affairs, and occasionally, the board members switch places to expand their own experiences. L’Hommedieu will fill the seat previously held by Trustee Robynn Sundermeier, who has moved to the Parks and Recreation Advisory Board. Commissioners ended the meeting with a showing of a video titled “In the Scope of Your Authority”, produced by the Colorado Intergovernmental Risk-Sharing Agency (CIRSA). Members were educated in what topics were appropriate and what were not when talking to citizens/constituents on a one-on-one basis, as opposed to holding a noticed public meeting. While matters defined as ‘legislative’ may be discussed without much reservation, matters defined as ‘judicial’ may only be discussed in public meetings of the Planning Commission. The next meeting of the Planning Commission is scheduled for Monday, March 6, 2017, at 6:00 p.m. in the public meeting room of the Civic Center at 341 W. 7th Street. Meetings are open to the public and an agenda can be obtained from the town website, www.townofpalisade.org or at Town Hall at least 24 hours before the meeting. In the interest of transparency, Betsy McLaughlin is also a member of the Planning Commission.